Our clients stay with us because of service and efficiency. Welcome To Old Security Title Co.
Old Security Title Company of Sikeston, Missouri, provides title search services, title insurance and title closing services for real estate, property owners, buyers and lenders throughout Southeast Missouri. Since 1963, realtors, sellers, buyers, lenders and contractors have turned to Old Security Title Company for title searches and real estate services needed for their residential, commercial and agricultural real estate transactions. Services include title searches, name and tax searches, title insurance, title closing services, 1031 exchanges (Qualified Intermediary and accommodations) and escrow services. The commitment to excellence and accuracy begun by Dwight Crader, attorney at law and title agent, nearly 50 years ago continues today with David Crader & Karen Crader Bizzell. Clients rely on Old Security Title for accurate service. Clients return to Old Security for a variety of real estate title and legal services knowing their needs are handled promptly, accurately and economically. You too can depend on a dedicated staff to go that extra mile for you! Contact Old Security Title Co. for more information or place your title order online. 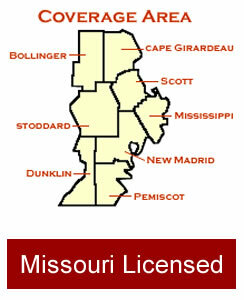 Old Security Title Co. provides real estate title services for residential, commercial and agricutural property transactions throughout Southeast Missouri. Our experience of nearly 50 years in the business, combined with our in-house legal staff, assures you of punctual and accurate reports with every search we make.